Cavallo Grigio crop circle, June 30, 2013. Brilliant! This June 30, 2013 crop circle at Cavallo Grigio, Robella, Asti, Italy is indescribably delicious (except for the smell). I wonder if the Circle Makers perceive the smell of hydrogen sulfide the same as we perceive it? What we have here, brought to my attention by the ever-alert crop circle analyst extraordinaire Red Collie, might be a schematic representation depicting a method of energy production best described as a LENR (Low Energy Nuclear Reaction). 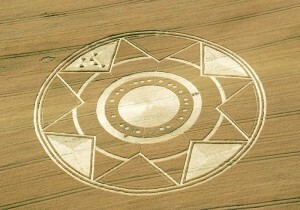 If this is what this crop circle represents, then this presentation can only be regarded as clever, clever, clever!!! I think that Collie hit the nail on the head with this logic, and there are reasons to believe that LENR’s are not only possible, but are in fact now currently being employed in the Rossi E-Cat nickel-powder based cold fusion device. At least, that is Rossi’s claim, and such 5 MW units are apparently now commercially available for purchase. Similar to the Pons-Fleischman “cold fusion” experimental set up, which used a palladium electrode as a postulated catalytic lattice, what we are seeing depicted in this crop circle may be a LALENR ( Lattice Assisted, Low Energy Nuclear Reaction ). “TB’s” diagram of the Cavallo Grigio crop circle. Look at the crop circle diagram, and compare to what you see in the K2S crystal. Is it possible that the K2S crystalline lattice structure is very cleverly represented, schematically, in this crop circle? Might the K2S crystalline lattice provide just the right stereochemical configuration that would allow the trapping of 2 or more deuterium atoms, forcing some of them to undergo a nuclear fusion reaction yielding 4He and 24 meV? And, might an energy source promoting such a reaction be supplied, in part, through the spontaneous beta-decay of 40K (potassium 40, an unstable isotope of potassium, naturally occurring, with a very long half-life) which might start the reaction? 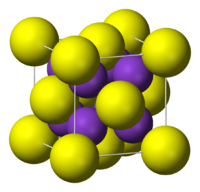 Here is a different rendering of the lattice structure of potassium sulfide. This crystalline “cage” might serve as a deuterium trap, allowing hydrogen atoms to freely pass through while trapping deuterium atoms within the matrix of the crystal. Once two or more deuterium atoms become trapped within the cage, and with exposure to the beta-decay of potassium 40, is it possible that the deuterium atoms might fuse? The smaller triangles we see may represent hydrogen atoms. All of the smaller triangles are identical in size and shape, and therefore all likely represent the same entity. The 6 smaller triangles contained within the larger, peripheral triangle appear to be randomly distributed, perhaps representing gaseous hydrogen, while the three smaller triangles emanating from the binary circle may imply that hydrogen atoms are able to pass freely through the K2S crystalline matrix. Additionally, the apex of the large triangle encompassing the 6 smaller triangles is directly centered on the portion of the binary code which denotes “H” (hydrogen), highly suggestive that the smaller triangles do indeed represent hydrogen atoms. At the very least, we must admit that this interpretation is intriguing! Another item of note relates to the presence of S (sulfur) in this schematic. Naturally occurring sulfur is found as S8, with 8 atoms of sulfur composing a molecule of elemental sulfur. We find 8 points of the star presented as the major visual component of this crop circle. Additionally (per Red Collie), we note that 32S is the most common naturally occurring isotope of Sulfur (95%), and we find 32 binary digits in the formation! This seems unlikely to be a coincidence. 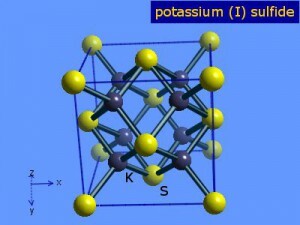 But, the 8 large peripheral triangles may be the more salient feature of the diagram, representing how the 4 K (potassium) atoms are encased by the sulfur atoms within the crystalline matrix of K2S. The crop circle’s central circle would then represent the sulfur atom nested in the center of the 4 potassium atoms, in either the upper or the lower plane of the K2S (potassium sulfide) crystal. When will our world begin to understand that these Crop Circle formations occurring all over the world contain information which may be of extreme importance to our civilization? Will someone with access to a proper laboratory facility attempt to replicate what we are seeing in this crop circle, exposing potassium sulfide to hydrogen gas which carries 1 atom of deuterium per 6,420 atoms of hydrogen (the ratio found in seawater), perhaps in an enclosed and pressurized vessel? Will a “cold fusion” reaction occur? One other side note that is possibly relevant. Many people have reported the smell of hydrogen sulfide (rotten egg smell) when in close proximity to a UFO. Perhaps what we have been shown in the June 30, 2013 Cavallo Grigio crop circle may explain why this is so. My thanks to “TB” for the use of his/her excellent diagram! 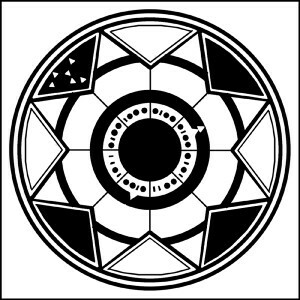 Executive Director, Crop Circles Research Foundation, Inc. I have been studding crop circles for more than a few years. I think I know what they mean. I was showing my son the pics and from the mind of a child comes the answer, after weeks of research I am cretin I know what they are put here to teach us. I would like to find a legit group to share my idea with and see if anyone else has come up whit the same thing. I am not a nut job I am a profession Investigator and have been for 7 years. What do you propose? Do you search for co-workers on the subject? I have some energy for that and I like to research c-cs.